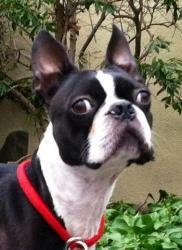 Eddie is enjoying running and playing with his foster brothers! Not the greatest footage! Bea is a door opening genius! Bertha is loving life with Ellen Hansen and her family. 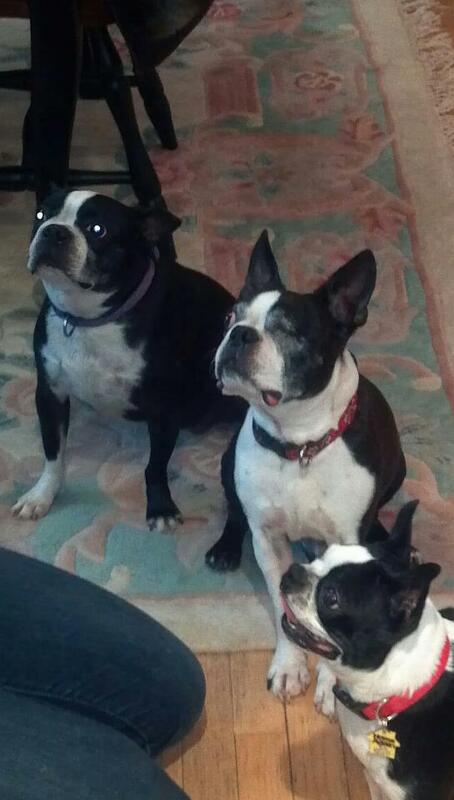 Ellen says, "I live in Rockland County, NY with four rescue dogs. Thor and Bubble who are cairn terriers, Hank, a norwich terrier and Bertha, who pretended to be a Boston Terrier to get into my home as a foster. One year later she runs this house!!!!" We're so glad that Bertha is a permanent part of your family, and thank for all you do for NEBTR! You'd have to see it to believe it! 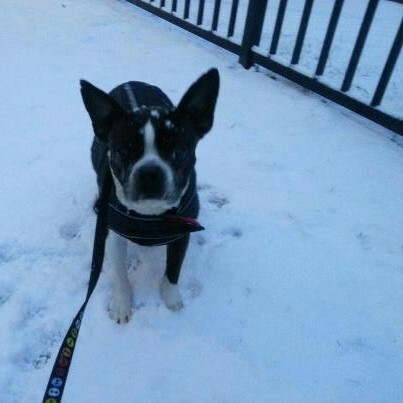 Flo thinks she is some sort of mountain near trucking through the snow! Congratulations to Simon, who has found his forever home with his Foster Mom Mariah Elliott. Mariah decided that Simon was too special to live anywhere else, so he will be with her for the rest of his life. "Brooke, aka former NEBTR "Bklyn", had a play date with NEBTR's Chester this weekend along with Maggie the Boston, Jess my Boxer, and Nikki the Boxer. Everyone was pooped out afterwards!!" Dana Ujobagy, and Maggie is Walter Williams' girl. What a fun event this must have been! 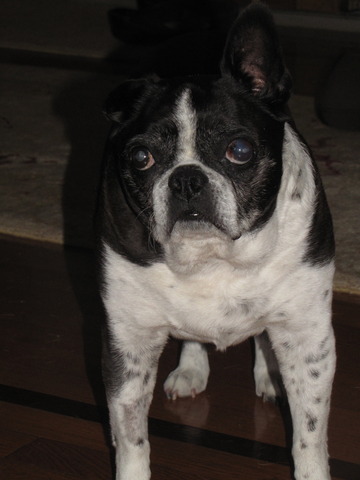 My heart is heavy and sad as I learned this morning that one of our former fosters, Rozie, has passed this morning. 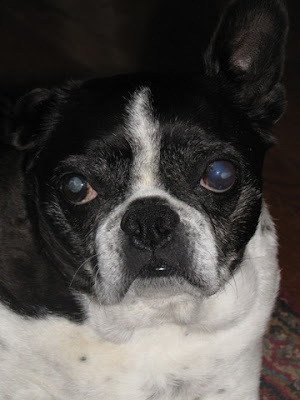 She was recently diagnosed with cushings and started treatment including acupuncture. They expected to have more time with her so this comes as a bit of surprise. Please keep them in your thoughts and prayers as they grieve for their loss. Hi Everyone, I know he is not a BT, but I feel like everyone can always use a little good news! The Brussels mix I had with me for a few weeks from one of the other rescues I work with finally got adopted. He was in rough shape when he was pulled from a high kill shelter in Ohio, crawling with fleas, with horrible teeth, and likely much older than the 9 years he was estimated at. 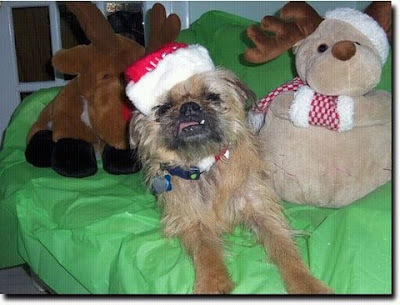 Well, Lord Farquaad, now "Buddy" has finally had his dental, and went to his forever home this past weekend. He has kids to love, and they just love him! It definitely takes a special family to take on a senior like this. I am so grateful to the Brussels rescue that took him on, and so happy for this dog, I just had to share. He was at death's door mere days before he came to me, and now he has the life all dogs should have =) It just goes to show there is someone for everyone out there, we just have to keep searching! Special thanks to Foster Mom Charlene Miller for opening up her heart and home to this beauty! 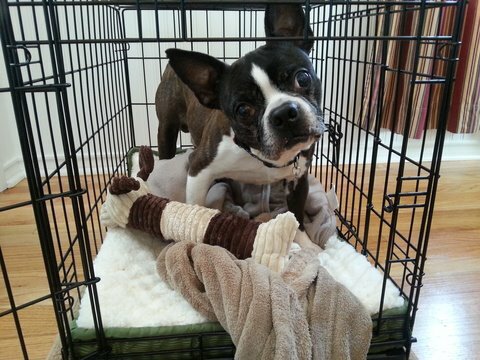 Congratulations to Bosley, who was recently adopted by the Downing family. 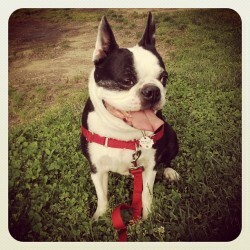 Bosley is a handsome one and half year old Boston Terrier. There is still a lot of puppy in Bos. He loved to play with his foster brothers and sister. He enjoys exploring the yard and running like the wind. Bos is learning how to play with toys. He will be a really fun dog to train. Bosley has had some medical issues in his short life. He recently had knee surgery which will allow him to run and jump pain free. This young boy was left on the doorstep of the Allentown Clinic vet's office one cold night a few weeks ago. The office is the one Dawn Stone uses and they were amazing. 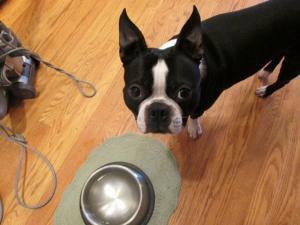 Here's an example of another Boston Terrier who had a rough start in life, but reacts with nothing but love. Special thanks to Foster Mom Janice Boyer. 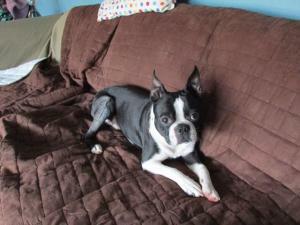 It was through her loving care that Bosley got to blossom and be ready for his forever home. 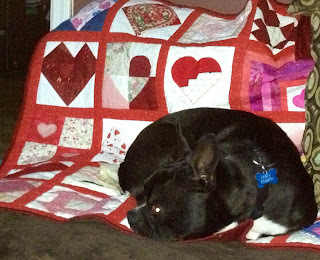 Congratulations to Hank, who has found his forever home with the Gonzalez family. And special thanks once again to Carolyn of Kamp Kanine, who has found the perfect home for him, and gave him the training and love Hank needed to succeed! 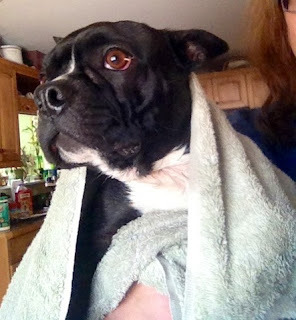 Here's a pic of new foster Cody, a 3 year old playful, affectionate pup! Cody is a mushy love. Thanks so much to Marjorie Young for fostering him. Congratulations to Tori, who has found her forever home with her Foster Mama Rebecca Bazell. We're thrilled that Tori will be forever loved and cherished. 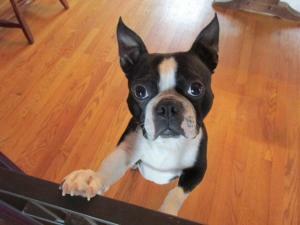 Tori is of the sweetest, cutest, funniest Boston Terriers you will ever meet. 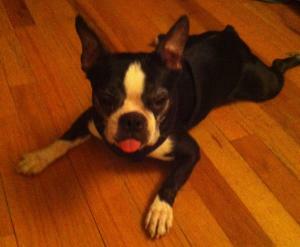 She is shy at first, but quickly becomes a funny clown, and yes, her tongue sticks out a lot of time! She is brilliant, too: taught to be housebroken, to "sit" and to walk on a leash in just a few days. Her favorite thing in the world is to hang out with humans and have her belly rubbed. 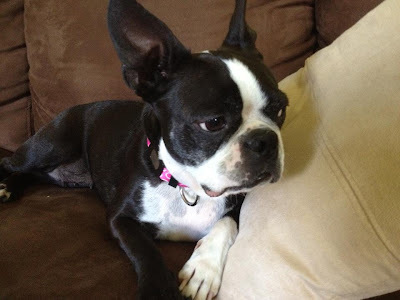 Tori was a puppy mill mama, born and raised in the same mill where she was forced to breed. She had five litters in four years. She didn't have any toys or chews, so her teeth are ground down to the nubs. For the first time in her life, Tori gets to be a puppy herself. And boy, does she appreciate the good life! She ADORES people and her favorite thing in the world is to snuggle on the couch and be held. Thanks to Rebecca, she will have this life forever more! Thanks to Cindy Kaiser for taking in this beautiful boy!